Panel of 15 NASA astronauts who are traveling with Viking Orion as Anna Fisher's guests. Lynn Sherr moderated the panel. MONTE CARLO, Monaco — NASA astronaut Drew Feustel called the Viking Orion cruise ship Saturday (June 16) to speak with his wife, son and passengers on board, marking the first time that the International Space Station has contacted a nonmilitary vessel. 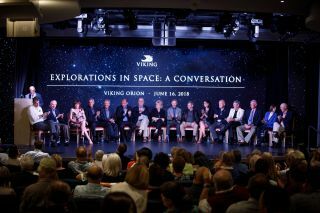 A panel of 15 NASA astronauts gathered in the Star Theater on Viking Orion to share their favorite experiences in space and talk about what's next for space travel. Just as the panel got started, a surprise phone call came in from the orbiting lab. Feustel arrived at the space station on March 23, joining Expedition 55 for a five-month stay. He and astronaut Ricky Arnold just completed a spacewalk on June 14, during which they installed new brackets and high-definition cameras outside the station's Harmony module. Feustel is scheduled to return to Earth on Soyuz MS-08 in August. "We really miss you here," Anna Fisher, retired NASA astronaut, who was named "godmother" of Viking Orion, said to Feustel on the phone. "I know that you really want to be here, really badly — you're in the only place that perhaps is better … we really appreciate all the work that you're doing." Feustel's wife, Indira Feustel, and son, Aiden Feustel, who were also traveling with Viking, had the chance to say hello when the call came in to the ship. This was a particularly unique opportunity for the Feustel family. For many of the panelists, calling home was not an option when they were working on either the space shuttle or the space station. Fisher flew as a mission specialist on the second flight of the space shuttle Discovery, STS-51A, in November 1984, only a few months after she delivered her oldest daughter. "Back in those days, all you had was the air to ground, and of course you weren't going to have any kind of private conversations," Fisher said. "I'm really jealous of all the wonderful things that people on the space station now get to do." Following the phone call, the panel members shared their personal experiences in space and where they see the space program going next. "I feel like I was blessed to have [had] that experience. For me, it really [comes] down to three things when I reflect on my time in space," said Nicole Stott, a veteran NASA astronaut who participated in missions on both the space shuttle and International Space Station. "The three things that I think about every day are … we live on a planet, we're all Earthlings and the only border that matters is that thin blue line that blankets us all." Dominic Antonelli, director of advanced programs for the commercial civil space line of business for Lockheed Martin Space, reflected similarly on his time as pilot of the space shuttle. He specifically noted the difference between "knowing" that we live on Earth and "feeling" like we are a part of the planet. "You really need to feel this, instead of just think about it," Antonelli said. "Until you transition to feeling like you're from Earth, we won't make this great transformation that I believe is right on the edge for humans — I expect us to go accomplish great things." In many ways, space travel has benefited human life on Earth, including medical and educational advancements, retired NASA astronaut Charlie Walker said. "Extension of the human presence through human activity in space is absolutely critical," Walker added. This includes going back to the moon, the Orion spacecraft and traveling to Mars and beyond, the panelists said. As the panel session came to a close, a young girl in the audience asked, "What's beyond the space?" Recognizing all that still remains unknown in the universe, Walker simply answered, "Let's go find out." The panel, called "Explorations in Space: A Conversation," included astronauts Antonelli, Jean-François Clervoy, John Fabian, Fisher, Rick Hauck, Jay Honeycutt, Richard Linnehan, Jon McBride, Michael McCulley, Barbara Morgan, Paolo Nespoli, Brewster Shaw, Sherwood Spring, Scott, and Walker.